Pi, our old, irregular friend who, like some of my relatives, is extremely useful at times but also goes on forever: 3.141592653… Simply put, Pi is the ratio between the diameter and the circumference of a circle. It has been studied for thousands years and ubiquitous in Euclidean geometry and analytical mathematics and even crops up in the Greatest Math Formula Of All Time, Euler’s Identity: ei? +1 = 0. No, seriously. A poll of readers conducted by The Mathematical Intelligencer in 1990 named Euler’s Identity as the “most beautiful theorem in mathematics”. 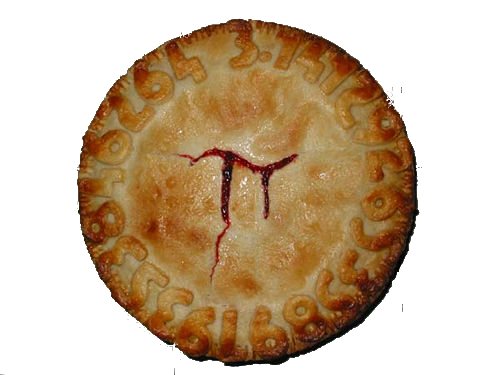 Those silly foreigners who put the day in front of the month will never know the beauty of Pi Day without a serious rearrangement of their calendar and consequently can never understand the orgasmic mathematical purity of March 14th, 2015 at 9:26 and 53 seconds: 3/14/15 9:26:53. This is a once in a century event, my friends. So how perfect was it that on Saturday morning I found myself at Stanford University, second only to the University of California, Santa Barbara for its appreciation of math and science? I also had some pie. Thank you Kevin Barry. The reputation is intact. Valerie, great to hear from you and good luck with the upcoming trial. The reason the Hail Pelicus was going to the old address after you updated your NCRRS details is that we maintain separate email and contact lists. The pelicanref.com site has the official contact details for the Northern California Rugby Referee Society, but Hail Pelicus is a completely different animal, gnashing and ravening across the internet with reckless abandon and malice aforethought. While kindly looked upon (mostly), Hail Pelicus is not the official organ of the NCRRS but more like a pirate radio station that is tolerated but not fully understood. If you would like to change the address that the HP goes to please send a request with BOTH THE OLD AND NEW email addresses to hailpelicus@pelicanrefs.com. We need both email addresses so that the old address can be removed while the new one is added. The HP email list goes out not only to the whistlers of Pelicanland but to coaches, players and anyone else that wants to receive it – we aren’t picky. There are a number of recipients who do not live in Northern California and have sadly never been here, including some international subscribers who found out about us on the dark web or via our anonymous 4chan posts. So thus we come to the core reason that there are separate email lists – plausible deniability. Happened yesterday. If your weren’t there you totally missed out. It felt great to finally get back into the groove of being around rugby now that I’m fully healthy again and able to exercise. What didn’t feel so great was the 85+ degree heat wave that was swirling around Watsonville. Before kick off I told both captains that if we ever needed to take a break during the game for water, they should let me know and we would make sure no heat casualties happened during the match. Things started out pretty slow with Google getting their first try in the 11th minute after a missed punt to clear the ball inside Aptos’ in-goal, and Google easily falling on the ball. In the 18th minute, Google got another try. Toward the end of the first half Aptos answered back with a pair of tries, with one successful conversion. 12-10 for Aptos at the half. Second half favored Google where they were able to get two tries with two conversions midway through. In the 75th minute, a penalty inside the 22 gave Google the opportunity to kick for points, where they were successful. With everyone tired and covered in sweat, Google was able to get one more try before the final whistle. Besides the turf was very hot , it was very good game to enjoy. Vacaville did very well the first five minutes, just a simple mistake give Baracus a chance to have the first score of the game. Thank you Mike for the great opportunity to work with you. Baracus and Vacaville, enjoy the second round of our seasons. Looking forward for the second round. A hot day in the city, and the turf fields were even hotter. Both B sides were ready to get playing soon after the A side ended. Baracus dominated the tries with a few breakaways from a super speedy outside center. In open play, there were lots of back and forth turnover balls off of knock ons or mauls, which allowed us to play without too many whistles. Baracus had 5 tries each half, mostly off of back plays, but a few from some pounding in by the forwards. Vacaville had a try each half, giving them some payoff from their hard work. Hard fought match between two talented teams. Unusually warm March day on the beautiful CSU Chico Campus; High 70s and sunny without a cloud in the sky. Partially due to their superior roster numbers, UC Davis was fresher and opened the match with two quick converted tries. At halftime, UC Davis emptied their bench, and the second half was much closer. Chico State drove the length of the pitch twice to score tries and UC Davis scored on a long breakaway try to bring the final score to 21-12, Davis. Very cleanly played match with good tackling and ball movement by both sides. A hot day in Kelly Park in Menlo. Both teams prep’d and also took on plenty of water. Throughout the game water was on boarded at all scores and injuries. EPA Bulldogs started the stronger and scored on 4 minutes to lead 5-0. While the Bulldogs continued to dominate territory Santa Rosa got progressively into the game making progress when moving the ball to their speedy back three. By mid way throught the first half the game was being played between the 22’s. Bulldogs bigger ball carriers then created a score on 24 minutes. As Santa Rosa pushed hard to get on the scoreboard an intercept freed Bulldogs players to score on the left side. Neither was converted with the score 15-0. The final 10 minutes was dominated by Santa Rosa. On 32 minutes the outside backs made ground down the left offloaded inside and crossed by the posts. 15-7. On 37 again ground was made again on the left with the ball again released inside. This time the defense made the tackle but a quick recycle delivered the score. Again converted. The second half started with an even quicker score for Bulldogs on 2 minutes. Converted. 22-14. Santa Rosa responded with a try on 8 minutes to close to 22-19. On 16 minutes Bulldogs restored their 8 point lead with a try. 27-19. Santa Rosa pushed hard but Bulldogs defended strongly and on 26 minutes turned over an attack and with some off loads stretched the lead to 32-19 with a try. Having stretched the lead they visible relaxed and suffered at the restart with Santa Rosa returning the restart kick through multiple phases for an immediate response. Back to 8 points at 32-24. This stirred the Bulldogs who made up for the mental switch off with their final try of the day on 34 mins. 37-24. Santa Rosa again responded to this score and dominated the final 5 minutes. The last 3 were camped on the line. Bulldogs committed a number of breakdown infringements in this period and having been warned a yellow card was issued for repeat team infringements. From the next play Santa Rosa crossed under the posts with the conversion being the last kick of the game. 37-31. 6am wakeup. 6.10 on the road for the day of service — doing my duty up in Humboldt. 2 games on the docket — State and Club men were back to back at noon and 2. Or at least it would have been noon, but nobody told the trainer that people needed taping up before the game. So we sat and waited for a while. I politely suggested to the visiting Keelhaulers that they not do their pregame chant. They equally politely obliged and kicked straight off. First half started out a bit nervy — a few technical errors at scrum and lineout, but the teams settled into an even contest, the only items of note in the half being a try by the visitors and a yellow card to the hosts for tackling a player in the air. Silly stuff. The second half started and the Keelhaulers started to figure out the gaps. Their scrum worked better, and they moved purposefully in the backs with ball in hand. 3 more tries were dotted down and effectively ended the contest by 60 minutes. The Jacks, playing in front of a loud, partisan crowd, weren’t going to go quietly, and scored a couple to make the score a more accurate reflection of the standard of the contest, which I was thoroughly enjoying. Throughout, there was an element of chippiness to it, and I spoke with both teams and players on both sides about the desire to keep it passionate but safe. Shortly thereafter time was up, and it was time to dash over to the other field in McKinleyville for the second game. After my dash over to the second game, I did prelims as quickly as possible prior to kickoff. An issue arose with a couple of the Colusa players using boots that they bought from World Rugby Shop, made by Nike, which have screw in cleats that are clearly not legal. The ends are flat, they do not have a rounded edge, and the tip is pointed and does not have a sufficient cross-sectional area (apparently 78mm^2 at a depth 2mm below the tip — this equates to 10mm or 2/5 of an inch). They swapped them out promptly without complaint, but I wonder what possesses a supposed rugby outfitter to sell gear that is banned from the game. The boots in question are manufactured by Nike. Keep your eyes out. The game itself was more an issue of control than anything — various people wanted to make dangerous tackles, question me, question the other team’s manliness, the usual. Unlike the previous game, we collectively managed to keep everyone on the field for the full 80. There was one point where I did have to pull out the ‘I don’t know what you think you can get away with saying to me, but let me assure you that this gentleman (#8) has overstepped the line’. The captain asked for time to go talk to his guys. Good idea. The Colusa coach also channeled his inner Galileo Galilei, when he complained about a perceived dangerous tackle. I stopped the game, went over and explained that, while he might see it that way, here’s what I saw, why I called it, and further that I’d be grateful if he’d be quiet. Just as Galileo, who after retracting his theory that the earth revolved around the sun said “Eppur si muove”, so the coach apologized, but then walked away with “but it was still dangerous.” And promptly got told to leave the enclosure. OK, so leaving the enclosure is merely stepping back behind the rope, but it’s an important symbol of the revocation of privilege. He did this without further complaint, and we shook hands and smiled about it after. All good. The game itself was largely one-way. Colusa clearly were the better organized side, and ran away with it, 76-10. And with that, it was back in the car, 5 hours up and over the hill to Redding and back down I-5. I’d have stayed, but there was a half marathon in Sacramento the next day. 1h 32m. Passable. A ridiculously hot afternoon for March combined with heat coming off the turf field to drive temperatures on the pitch to the 90s. The match itself was also hot, with two unbeaten teams coming together to settle the pecking order in D2. Both teams had physical, mobile packs, with pace to burn in the backs. Life West opened the scoring in the first few minutes of the match. Sacramento marched down the pitch, and banged over a penalty kick to pull it back to 7-3. Life stretched their lead to 14-3 before the Capitols scored their first try in the 25th minute, and pulled the gap back to four points. From sustained pressure, the Capitols kicked another penalty to pull to within a point, before Life West infringed in a goal line stand and conceded another penalty right before the end of the first half, which the Capitols used to get in front 14-16 at the break. A reinvigorated Life West team recovered the lead with a converted try in the first few minutes of the second half, and never looked back. In all, Life ran in 6 unanswered tries in the second half in a scoreline which didn’t do justice to the Capitols’ contributions to the match. Thanks very much John Pohlman and Bryant Byrnes for their assistance on the touchlines on a scorching afternoon. A very, very hot Hayward venue. This was another rump game, as most club B side games are; a 20 minute half and a 15 minute half (then we got tossed). The Caps were game but tired-most had just played in the A match. Not so for the Chiros-In-Training; the fresh legs of these putative DCs (am I correct on this point?) yielded five tries. Life West Woman hosted SFGG woman at Cal State Hayward’s Pioneer Field this past Saturday. Beautiful day for rugby. The all turf field did get hot as the sun it midday. Life was led by #15 Cameo Motley who scored at least two first half try’s. Life totaled five trys in the first half to SFGG’s two. Both of SFGG’s try’s scored by #13 captain Naima Reddick. First half score Life 29 SFGG 10. SFGG has had a load of injuries. Life is gaining experience rapidly. These combined facts led to a final score of Life 48 SFGG 15. A very even match took place in Ukiah with great weather and a relatively large crowd for Mendo’s last home game. Controlled by the forwards for most of the first half, and after missing two penalty kicks at the 25th and 26th minute mark, Shasta finally crashed through one minute later for the only score of the first half, taking a 7-0 lead. Early in the second half, Shasta made in 10-0. Both teams started getting the ball out and the backs started scoring. It was knotted up at 17-17 with 15 minutes to go, so it was anyone’s game. I think the fact that Shasta had zero substitutes, only 15 players, started to hurt them as Mendocino had the energy to score two more tries to seal the game. The game ended with Shasta pounding towards the try line, with at least one “held up”, for 5 minutes straight, but Mendo’s defense was relentless and the game ended 27-17. Once again, the party was well attended and there was food for all !! A week when there was great international rugby going on in the 6 Nations and at the Atlanta 7s, two Division 3 clubs got together in Northern California and reminded everyone what is great about the game. The technical skill and fitness may not be the highest, but the game was played with great intensity and in good spirit. Things percolated a little, as they would with any competitive match, but nothing that a post-match beverage wouldn’t fix. It was a warm Central Valley day when South Valley arrived in Turlock to take on Modesto. South Valley came in fighting for 1st place in the standings, but Modesto had their Old Boys were in attendance and came to play. The first half was an up and down affair, with South Valley kicking deep and putting the Modesto fullback under pressure, but he was up to the task. While Modesto took penalties as an opportunity to kick for touch and the gain in ground, South Valley went for the points. South Valley’s early kicks went amiss and Modesto capitalized with a try. South Valley finally collected a kick late in the half and went in down 7-3 at the break. Early in the second half Modesto collected a try in the corner, despite being short a man after being carded for repeated offense and the possibility of an upset started to look real. South Valley then showed why they are playing for the league lead when their backs struck for several strong runs. Two tries and one conversion finally gave them the lead heading into the final quarter. The specter of several close loses Modesto suffered this season hung over the match as South Valley camped out in the Modesto half, when Modesto intercepted a wayward pass and collected a converted try. A late penalty sealed the upset. Unfortunately I couldn’t hang around after the match, but I am sure I would have enjoyed the banter between these 2 rivals. SF Fog travelled with a severely depleted side, with players crying off on the morning of the match. They have several good players but these few could not hold off the larger number playing for Reno (who were also physically larger as well) as well as the overall rugby experience of the Reno team. The field is not bad, although the local dog owners should find a supply of bags to police up after their dogs – this is after all a neighbourhood park where children play (quite apart from rugby playing). Reno had nearly all of the play running in 6 tries in the first half (only 1 conversion) to 1 try for the Fog. The fatigue played hard on the Fog in the second half when they conceded 7 tries (again 1 conversion) to 1 try in a 20 minute second half. It was a Saturday and rugby was played. Not sure what the Blackhawks had in their half-time drinks, but I need some. It was 17-13 at half to Sacramento, but then they shoveled on 59 points in the second half, which was somewhat impressive given that it was 80 degrees and they played for 30 minutes with fourteen players. The home team didn’t seem to understand that you can’t tackle players around their necks. Diablo battled away but didn’t have the experience or the depth and it showed in the second half. It was a sunny day under the blistering heat of the Sacramento sun. The sun affected everyone’s abilities that day. We started off at a blistering pace where Sac scored two tries in a row quickly to take a 10 – 0 lead. St Mary’s was able to stabilize and score right back. By half time St. Mary’s had worked themselves into a narrow lead 15 – 10. The second half was filled with physical runs and long stretches of open play. Sac St seemed to dominate this session. Being more comfortable playing in the hot hot weather helped them pull ahead and never look back. Final score Sac St. 41 – St Mary’s 25. Just like the ongoing cricket world cup, this was a day/night match that started under 80F sunshine but ended under lights. Cal rested most of their starters but still dominated every aspect of play, sprinting to a 56-0 halftime lead and scoring 18 tries in total. The margin would have been even larger had the Cal ball carriers used their support more often. Much thanks to Neil MacDonald for his help as AR. Fine warm day in Santa Clara, if anything, quite hot on the field and a water break was called-for in the second half. The score does not reflect the fact that this game was close and hard fought with a narrow score line through most of the match. Santa Clara defended and attacked well but could not overcome Sacramento State who found that passing the ball out wide produced considerable gain-line advantage and several tries scored by the wings. It was one really great collegiate rugby game from start to finish. Warm humid day at TI. Both teams looking to tackle hard and run hard. Fresno had lots of problems with offsides and ruck offenses early on giving SFGG points. Fresno started 2nd half very strong but lost momentum with lost opportunities. Ah to be back on ole New Pat Vincent field at St Marys. Another perfect rugby day on real grass. This was my second week doing a game involving UCSC women. I must say that they play like a machine. Support is almost always there a split second after a tackle is made. If there is a ruck it is very short and the ball is away again in the blink of an eye. The play in the first half was almost penalty free. I only remember awarding two. More penalties came in the second, but even then the count was low. St Marys play was pretty good, but UCSC was just too much to handle. In almost every game I do there tends to be at least one player that stands out to me for various reasons. This time it was St Marys’ #22 Chanel Farago. She was most likely the smallest player on the field, but first caught my eye by tackling a player twice her size. She ended up on her opponents’ back and rode until a teammate could bring her down. Chanel played with the heart of a tiger. A perfect setting for rugby but I think only the home side’s fans were entertained. Certainly not any neutrals. I had seen Fresno St earlier in the year and they had a good squad but unfortunately injuries have hit too many key players for them. It seems as if the 5 players they could least afford to lose are the 5 players who have been hurt. Stanford was ready to roll at home and dominated from the first whistle, scoring on their first possession within 2 minutes, and didn’t slow down from there. Fresno St tried to stop the tide but to no avail as waves of Stanford runners rolled on up the field for try after try. Fresno St had a few opportunities and were within meters of the try zone on more than one occasion but couldn’t get the ball across to score. Discipline held perfectly for both sides, something that is often difficult in a lopsided match such as this and all credit goes to both captains. The players tackled hard and played hard and never let frustration or arrogance rise to the surface. Fresno finished off the match with a try at full time which is nothing more than they deserved for their endeavor. It was 85 degrees in the beating sun at Stanford today, which broke my streak of 2 matches with double rainbows. Players from Fresno State said it was hot. They also said it was cooler at home. After playing in Fresno for the Mighty Mission many times, I find that difficult to believe. Stanford started out with 15 and cut back to 13. It was close the whole way. After watching Fresno A side having a really tough game, I thought this would be much of the same. Fortunately for everyone it wasn’t and I got my workout in. The difference in the game was a Fresno State (wing?) who fielded a kickoff and brought the ball back into his try zone and dropped it in the tackle and Stanford pounced on it. Fresno scored a try with 1 minute left on the clock to bring it within 7. After attempting a quick conversion, and the last play being the kickoff, Fresno State was pushing downfield, even got a penalty at Stanford’s 22. I thought I was buying beer for the meeting for the tie, but they never got it in. The only downside was uncontested scrums for about 3/4 of the game. Only one half of play between two UC Davis teams with a couple SJSU players. A beautiful day on the UNR campus including the National Anthem from the baseball field below. A very physical game by both sides. Chico was the first to score and gained three tries in the first 15 minutes of play to take a halftime lead of 43-7. Chico’s game plan was to get the ball out to their wings for quick play and done effectively. Nevada regained their composure in the second half with two quick tries and conversions from their outside backs and lost the second half by a try 21 -26. Thanks, Josh for the unexpected PR. Fast flowing match. The Chico State side took the lead early and never relinquished it, though the UNR side fought back with purpose at times. Easy commute by scooter to USF’s beautiful stadium pitch. USF last regular season match needing to win to get into their playoffs in Bend. They did not disappoint with an assortment of long tries by mostly their backs with an occasional forward scampering. 60-0 at half & 2nd half was just a little less intense. Solano JC had a few scoring chances but was thwarted by a swarming USF defense at the try line 2-3 times. Thanks for David Williamson helping me before, during & after the match. A beautiful day in Moraga. The St. Mary’s pitch, formerly used as the football field, is very fine indeed. The pitch had been heavily watered earlier in the week and the head groundskeeper approached me prior to the match asking if I thought it would be OK to play and that by playing the pitch would not get torn up…..a rhetorical question. The game was played with the utmost in sportsmanship. St. Mary’s had the upper hand but UOP turned the tables on them frequently throughout the match. One of those true gems to ref. 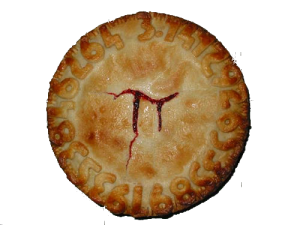 The most delicious rendering of Pi I have ever seen. This entry was posted in News on March 19, 2015 by James Hinkin.